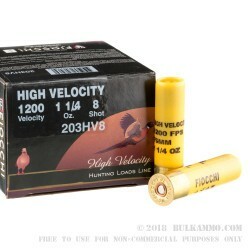 Designed to be highly effective in taking down birds and other similarly sized game, Fiocchi’s Optima High Velocity shotgun shells are perfect for hunting up to medium-range. 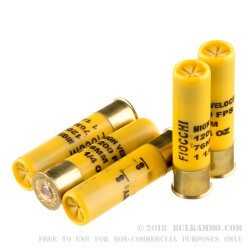 These 20-gauge shotshells, feature 1 ¼ oz of #8 shot loaded into a 3” shotgun shell. Capable of a muzzle velocity of 1200 FPS, these high velocity rounds deliver devastating performance at longer distances, while still maintaining tight shot patterns. 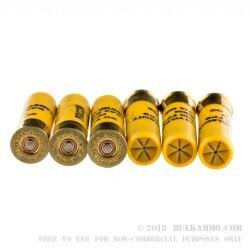 Using only high-quality lead shot, clean burning powders and primers, this high brass loaded shotgun shell delivers consistent performance in the field without breaking the bank. 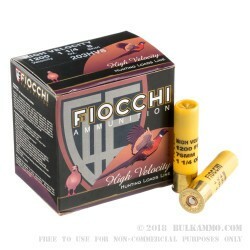 From their main manufacturing plant in Via Santa Barbara, Lecco Italy, Fiocchi continues to be a trusted producer of quality ammunition for a wide assortment of civilian, professional and tactical shooters. Beginning in 1876 with Giulio Fiocchi, the company has grown to possess a production facility the United States and is still a family run business with Carlo Fiocchi at the helm on the US side.